Disneyland Paris on the most popular entertainment resort in Europe and has been for many years. A rich blend of character and fantasy makes for a truly memorable experience for kids (and adults) as they venture through the entire Disney catalogue. Based in France, Disneyland Paris boasts over 4,800 acres of space, with two theme parks, hotels and dining facilities. Opening in 1992, the resort has grown considerably to the size it is today. There are plenty of places to stay around Disneyland Paris, with their own memorable villages which help capture your children's imagination. 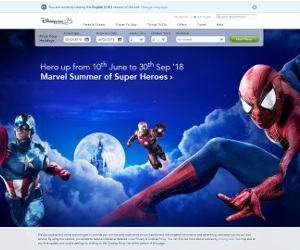 Be sure to keep your eyes peeled for discounts and voucher codes applicable to Disneyland Paris.